February World Poetry Writing Month - or WoPo - a writing drive I have been running for nearly a decade now, it runs through out Feb and I pop up writing exercises and various inspirational bits including guest bloggers and I have some fantastically talented people lined up as guest posters this year 🙂 There is also a Facebook group and page and posts will appear on TheMonsterBlogs twitter and the Pinterest board. Sun 17th of Feb - Waterstones Presents Villanelles with the Gloucester/shire Poetry Society 2-4 pm free event - this event is now on the third Thursday of each month bar April as it clashes with Easter Sunday. Sat 23rd of Feb - Folk Craft and Story Telling at the Folk Museum Gloucester (also known as the Life Museum) this is a free event as part of the Folk Trail during the Gloucester Folk Festival. Based in the Dairy and Victorian School Room out the back of the museum - sadly due to structural work the actual museum will be closed but the diary, cider press room and garden will be open. We will be running Rag Rug and Barge Painting workshops in the Dairy and story telling (including Aethelflead the puppet) in the Victorian School Room! Tomorrow Salaric Craft will be doing the Creative Take Over at the BlackFriers Hub in Gloucester - Wed 5th December 2018. Wednesday is their normal creative take over with workshops and co-working space and of course free biscuits! I have been looking for spaces to run my Upcycled Christmas Workshops which are free with donation bucket and they have Kindly stepped forward asked me to host! Alaric discovered this amazing website Below the Surface. This is a fusion of maintaining environments, urban upkeep, archeology, social out reach and art! Cataloguing all the finds from the river Amstel in Amsterdam during train line works they have built up an amazing image archive showing the depths and ages of the objects, you can explore this catalogue, find out things about the civil engineering around the project and create your own displays with the finds that catch your interest. This is all free and on line - the internet is starting to have these little lovely treasure troves of sites. This was what I envisioned the Internet being used for. For me though this project is tinged with a "could have been" here in Gloucester something like this was created back in the early days of the Internet and had the scholars and volunteers and council members enthused and then... it basically got unplugged and lost (early days of the internet I did say - things were different in those call up days!). Many museums and research institutes are also putting their photo archives on line - Below the Surface how ever is a lovely smooth and easily searchable interface which is slightly more unusual! There are over 700, 000 finds and the time periods spanned is more than written history - it is an awesome resource! The first half of the summer was pretty EVENT FULL with Women's History Month in London, Pride, The Aethelflaed Festive and general shenanigans but the second half looks to be even more... WOOP! 6-8th July - WordFest - some free events and some you have to pay for - lots of stuff to do.... I'll be running the area at the Quays again on the Sat. 11 am - 2 pm. And be in the Story Slam. Currently there are still spaces in both the poetry and the story slam if you want to compete. Sat 7th July 8-10:30 pm - £9 entrance - Ledbury Poetry Slam part of the Ledbury Poetry Festival. 14th-15th Art In the City - Free Events - I will have a stall for the whole weekend for both WigglyPetPress and Salaric Art and Crafts. I will also be live drawing for the competition on the Saturday and have art work on display in the library. Exact dates and timings of my exhibition to be called. 11th - 12th of Aug - Cranham Feast - it's a couple of quid to get in and is full of games, entertainment and there is cricket plus the deer roast, possession on the Sunday. Thurs 23rd Aug 11 am - 3 pm - Upcycled Crowns - free craft drop in workshops at Gloucester Cathedral. Plus of course all the normal things like Villanelles, Food For Thoughts, Stroud Out Loud, Buzzwords, Poetry Cafe Cheltenham, Drink and Draw Chelt, Piranha Poetry etc... which I get to as an when I can and are open mics or community gatherings so not me being booked to do a specific thing unlike the stuff above! This is Loki my hammer - it is a Thor number 2 copper and raw hide mallet and is one of the hammers I always paw over when we go to the welding gas shop. 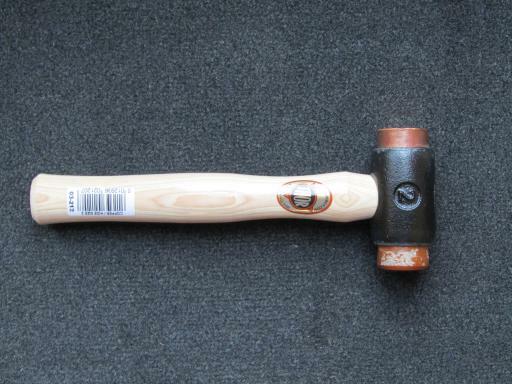 I kind of wanted a hammer for the workshops I am preparing for the Aethelflaed Festival in June so it seemed like the right time to actually take the plunge and buy the thing. These hammers are awesome and have been used for all sorts of things including the Royal Engineers during the second world war as it meant they could assemble last minute bridges at night in enemy territory without making loud hammering sounds. They are the mainstay of engineers who need to be gentle whilst hammering their machines or miners who need to avoid sparks (well did graduate from the Royal School of Mines!) and of course jewellery makers love these things! I wish I had the old one shown on the Wikipedia page - just look at it! Look at the mushroom wear on those hammer heads - this in an instrument that has made many things! You can read up on the manufacturing history and techniques on their website too 🙂 Since our visit to Makers Central I have been interested in where my tools actually come from - so am very pleased I can trace my hammer like this.